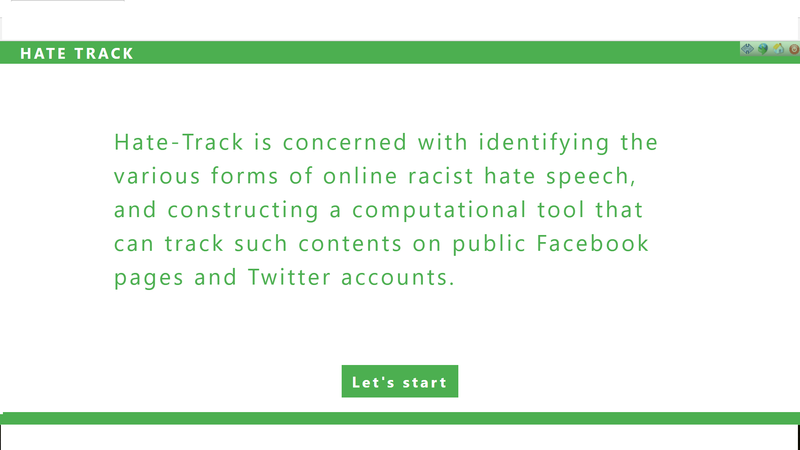 The project is concerned with identifying the various forms of online racist hate speech, and constructing a computational tool that can track such contents on public Facebook pages and Twitter accounts. The proposed project has identified a gap in relevant research and policy, in that most research tends to focus on racist hate speech emanating from organised or semi-organised groups, thereby overlooking ‘ambient hate’ of various intensities that circulates in social media; these may require different policy responses. Equally, while policy is concerned with the efficiency of the reporting mechanisms, there is very little understanding of the barriers to using the available reporting tools, and the emerging cultures of silence around reporting online racism. In contributing to addressing these gaps, the proposed project : (i) will derive a set of definitions of what constitutes online racist hate speech and its severity through focus group discussions with key informants from antiracist organisations; (ii) it will subsequently operationalise these as part of an algorithm that tracks and stores instances of racist hate speech on public Facebook pages and Twitter accounts. The algorithm will be written up as an open source software and will subsequently be applied for three months leading to (iii) the generation of a dataset containing racist hate speech; (iv) the dataset will then be compared to online racist instances reported through the iReport tool developed by ENAR (European Network Against Racism Ireland), in order to identify the types of racist incidents that tend to ‘fall through the cracks’; (v) finally, the project will conduct in depth interviews with victims/ bystanders to gain an insight into the motivations and barriers to reporting online racist hate speech. The findings will be written as a report with a set of key recommendations for policy to address all varieties of online racist hate speech. PreviousWill Trust Indicators Boost Quality Journalism?